Guns N’ Roses are streaming a series of short videos previewing a Not In This Lifetime tour announcement scheduled for Wednesday, May 24. Titled “The Beginning”, “It Doesn’t End Here” and “We’re Just Getting Started”, the clips trace the band’s history from its origins to present day while promoting further news regarding the tour that reunites the trio of Axl Rose, Slash and Duff McKagan. The trek launched with a series of warm-up dates that began with a rare club show at The Troubadour in Los Angeles on April 1, 2016; the event saw Rose break his foot early in the performance, requiring surgery and the use of a throne – on loan from head Foo Fighter Dave Grohl – for live shows until the injury healed. 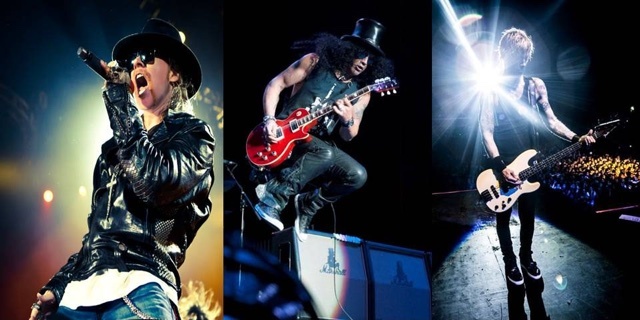 The Not In This Lifetime tour officially kicked off at Detroit’s Ford Field on June 23, 2016 and has since traveled to South America, Japan, New Zealand and Australia, among other places. The upcoming announcement will surface just days before Guns N’ Roses begin a European leg in Ireland on May 27. According to a recent report by Billboard, the tour has grossed more than $230 million since its April 2016 launch.